The Wissahickon Valley Park trail system includes over 50 miles of trails that cross the 1,800-acre gorge surrounding the Wissahickon Creek. Steep, rocky, and uneven terrain left much of the valley undeveloped, but in the early nineteenth century a variety of production mills were constructed near the tributary of the Wissahickon Creek and the Schuylkill River. The Fairmount Park Commission expropriated the land of the Wissahickon Valley in 1869 to expand the Fairmount Park system and began developing trails throughout the valley in the early twentieth century. 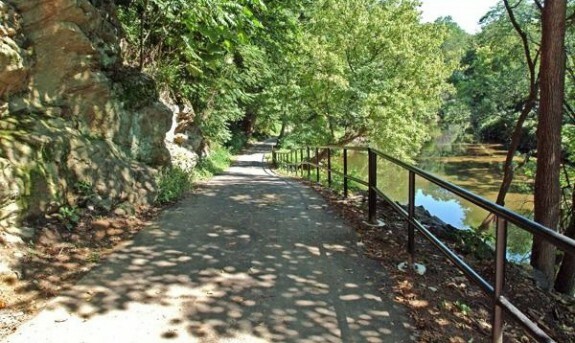 Organizations such as the Friends of the Wissahickon (founded in 1924) have assisted the city of Philadelphia in creating hiker-safe trails with limited impact on the surrounding environment. The hiking, biking, and equestrian trails covering the valley range from the wide and flat surface of unpaved Forbidden Drive to short and uneven paths along cliff edges, like one pictured. The Schuylkill River Trail is a recognizable landmark in Philadelphia. However, the history of the Schuylkill and its banks as an industrial artery is less obvious. Northwest Philadelphia grew from the economic opportunities made possible by the Schuylkill River. From 1816 to 1825 a small group of men who formed the Schuylkill Navigation Company built the extensive Schuylkill Canal system which spanned 108 miles and supplied power and transportation to Northwest Philadelphia for decades. Throughout the Industrial Revolution, the Schuylkill Navigation System fed power to the Manayunk mills while transporting coal from Northeastern Pennsylvania to downtown Philadelphia. However, after decades of work, the canals were surpassed the more efficient Reading Railroad system. By 1915 only thirty boats regularly traversed the canals, and then mostly for recreational purposes. 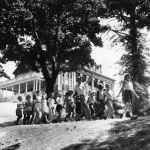 The operators of the Smith Memorial Playhouse, located inside East Fairmount Park, used the recreational trails around the property to provide activity and outdoor education to the children in their care. The Playhouse, a three-story, 16,000-square-foot house (in the background in this image), opened in 1899 to offer the children of Philadelphia a free and safe place to play through both indoor and outdoor play equipment. The popularity of outdoor activity and hiking clubs in the 1950s led the Playhouse to host a day-camp program sponsored by the city of Philadelphia called "Camp Chachee." 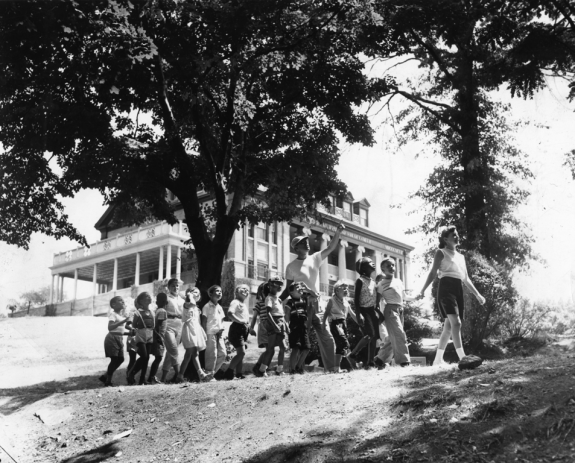 As pictured here during the August 1957 camp season, children started their outdoor adventure by hiking through the trails of Fairmount Park to learn about plants and animals near the Playhouse. 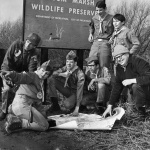 As part of efforts to preserve the Tinicum Marsh, Boy Scout Troop 400 from Ardmore, Pennsylvania, worked with conservationists to develop ten miles of trails around Pennsylvania's largest freshwater tidal marsh. Located in Southwest Philadelphia, the Tinicum Marsh and more than three hundred animal species were in danger of being destroyed in the mid-twentieth century as industrial development threatened the area. Preservation efforts to retain the land began in the 1960s, when it was designated a historical landmark and a group of bird observers created an organization, the Philadelphia Conservationists, to fight development on the land. 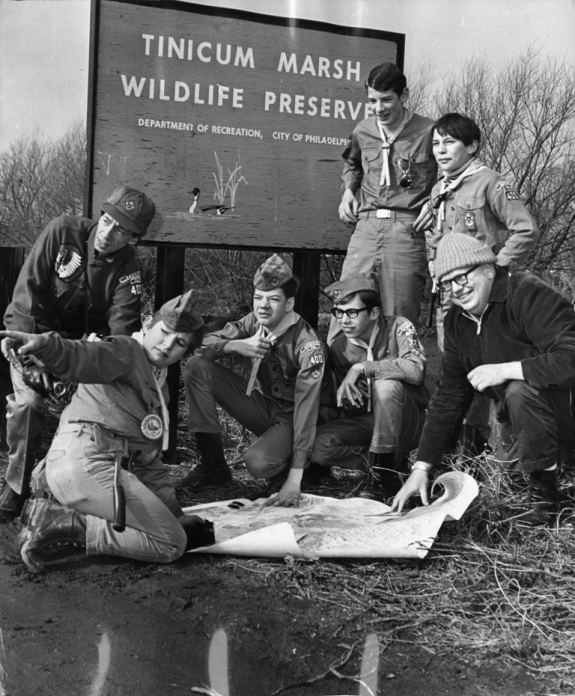 In 1970, the Philadelphia Conservationists and the Philadelphia Department of Recreation worked with local Boy Scouts to make the marsh more accessible to the public by designing a series of trails that would not interfere with the wildlife. The resulting trails were adorned with interpretive panels and educational signs. The Tinicum Wildlife Preserve officially became part of the Unites States Fish and Wildlife Service in 1972, preserving almost 1,000 acres of marshland. In 1991, the preserve was renamed the John Heinz National Wildlife Refuge at Tinicum in honor of the late U.S. Senator John Heinz, who fought to acquire additional land for the preserve throughout the 1980s. The mountainous terrain across Pennsylvania requires local governments and volunteer groups to survey and maintain trails annually to prevent erosion and keep trails safe. As walkers and cyclists use trails, they wear away the trail's surface, making it easier for runoff water from rain and snow to erode the path and create hazardous conditions. Leaving trails unattended can result in trail washouts or trail users creating detour trails to get around the hazardous area. The Wissahickon Bike Trail, pictured here running along Wissahickon Creek, was substantially repaired in 2007 after erosion created uneven terrain throughout the trail and left a small bridge structurally unstable. The city of Philadelphia partnered with the Wissahickon Restoration Volunteers and the Friends of the Wissahickon to identify sections of the trail system that required maintenance. 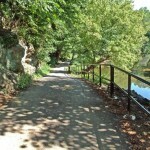 Although the Wissahickon Valley Park has rules limiting the use of the trails after rainstorms and restricts bicycle riders from certain trails without a permit, the Philadelphia Parks and Recreation Department and volunteer organizations spend thousands of dollars each year resurfacing and repairing trails. An expanding network of recreational paths for walkers, hikers, cyclists, joggers, and commuters serves the Greater Philadelphia region. The first recreational paths date to the mid-nineteenth century, when upper-class residents sought idyllic walking grounds in rural cemeteries and urban parks. In the twentieth century, grassroots hiking clubs built additional footpaths, but by the early twenty-first century governments and large contractors stepped in to create new multiple-use paths with state and federal funding. Walking, long a necessity of everyday life, also became viewed as a recreational activity in the middle to late nineteenth century. The invention of the telephone, advances in public transportation—first omnibuses, then cable cars and electric trolleys—and the emergence of a middle class that did less physical labor allowed some Americans to re-envision walking as something pleasurable and therapeutic. 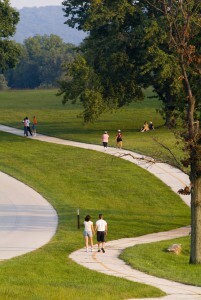 These potential hikers were also those most likely to be influenced by new ideas about the natural world portrayed in Romantic paintings of pastoral landscapes, Transcendental writings about the spiritual value of nature, and the aesthetics of rural cemeteries such as Philadelphia’s Laurel Hill and urban greenways such as Fairmount Park, which contained some of the first designed walking paths. Like many late nineteenth-century Americans, these new walkers formalized their interests by founding clubs. 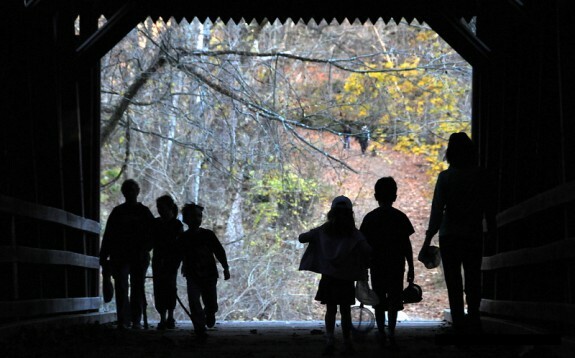 Hiking clubs—and the trails they built—came relatively late to the Philadelphia region. Early outing clubs, such as the Boston-based Appalachian Mountain Club (1876) and the San Francisco-based Sierra Club (1892), had thousands of members by the time a group of influential newspaper publishers and businessmen founded Pennsylvania’s first hiking club, the Pennsylvania Alpine Club, in 1917. Based in Harrisburg, the Alpine Club lobbied the state legislature to enact conservation measures related to outdoor recreation, forestry, and wildlife protection. The club also constructed the Darlington Trail, the state’s first modern hiking trail, west of Harrisburg. During the next several decades, middle-class hikers founded at least a dozen regional clubs throughout Pennsylvania, including the Philadelphia region. 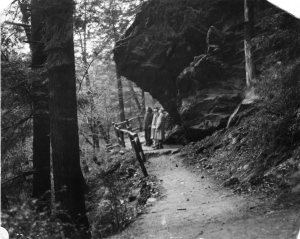 In 1928, the Back-to-Nature club emerged from a series of walks the Philadelphia Evening Bulletin organized as part of a “correct posture campaign.” The first hikes led groups of more than 500 people up and down Broad Street before the organizers realized that the hikers would be safer walking along the paths in Fairmount Park, nearby rural roads, and the more-distant Appalachian Trail. In 1961, the club constructed the fifty-mile Batona Trail across New Jersey’s Pine Barrens. Other hiking clubs were attracted to trail building even earlier. The New York–New Jersey Trail Conference, originally founded in 1920 as the Palisades Interstate Trail Conference, played an instrumental role in building the early Appalachian Trail from New York City, across New Jersey, and into Pennsylvania. The Philadelphia Trail Club organized regular trips to the Appalachian Trail, some seventy miles to the north, to maintain a section of the rocky, ridgeline path between the Delaware and Lehigh Rivers. In contrast, the Horse Shoe Trail Club, a suburban-based club founded by Henry Woolman in 1934, decided to build its own trail linking Valley Forge to the Appalachian Trail near Harrisburg. In addition to volunteer labor from the region’s hiking clubs, Woolman secured assistance from the National Youth Administration for the Depression-era project. As the name suggests, the 140-mile trail was opened to both equestrians and hikers. In the post-World War II period, the popularity of hiking increased dramatically as new outfitting materials such as nylon and aluminum, dehydrated foods, higher rates of automobile ownership, interstate highway construction, and the expansion of the state and national park systems made hiking more comfortable and convenient. During the late 1960s and early 1970s, the rise of the environmental movement, promoted by grassroots hiking clubs and institutionalized in federal legislation and funding, added new meanings to time spent in the woods. In response to the rising demand, state agencies and volunteer organizations created more and more trails in parks throughout the region. During the 1980s, a major shift occurred in the region’s trail activity, as well-groomed, multiple-use trails appealing to cyclists and walkers of all abilities grew in popularity. In part, the shift resulted from policymakers’ evolving understanding of trails’ positive benefits for economic development, public health, alternative transportation, and ecological functions such as storm-water management. Greater Philadelphia was well-suited to take advantage of these new ideas. The region’s post-industrial infrastructure of abandoned canal towpaths and railroad rights-of-way offered clear, level, and well-engineered corridors for recreational trails. 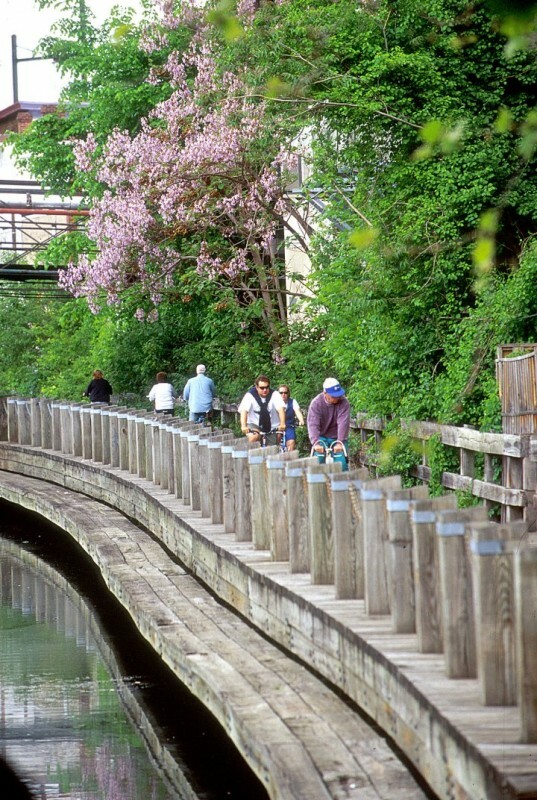 The Schuylkill River Trail, begun in 1979 by the Schuylkill Greenway Association, followed sections of towpath and railroad beds for 130 miles toward Pottstown, Reading, and beyond. Along the Delaware River, the Commonwealth of Pennsylvania preserved the anthracite-coal canal as a state park in the early 1950s, and, beginning in the 1980s, the towpath was re-envisioned as part of a larger trail system that would follow the Delaware and Lehigh rivers 165 miles north to Wilkes-Barre. Later studies showed that the two trails combined annually attracted more than one million users and generated at least $25 million for the region’s economy. Most trails were shorter in length and relatively local in their impact. In 1978, for example, Montgomery County purchased an abandoned railroad corridor that became the nineteen-mile Perkiomen Trail. 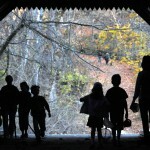 It took twenty-five years to complete but quickly became one of the region’s most popular trails for walking and biking. In the early twenty-first century, the trails movement once again experienced a major turning point. 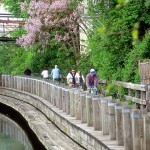 A coalition of environmental and bicycle advocacy groups, spearheaded by the Pennsylvania Environmental Council, the Bicycle Coalition of Greater Philadelphia, and the Delaware Valley Regional Planning Commission, successfully advanced a vision for an interconnected, 275-mile network of multiuse trails throughout southeastern Pennsylvania and New Jersey. In 2010, the coalition secured a $23 million grant from the U.S. Department of Transportation to complement nearly $33 million invested by the William Penn Foundation during the previous twenty years. 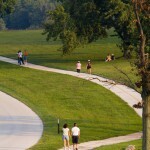 Along with state grants from the Pennsylvania Department of Conservation & Natural Resources, this funding allowed the coalition to fund priority trail projects, brand the emerging network of trails as “The Circuit,” and launch a sophisticated fundraising campaign that sought hundreds of millions of dollars to complete more than 450 miles of trails. Silas Chamberlin holds a doctorate in environmental history from Lehigh University and currently serves as a regional adviser in the Pennsylvania Department of Conservation & Natural Resources. His dissertation, “On the Trail: A History of American Hiking,” is the first comprehensive, national history of the hiking and trails community from the early nineteenth century to the late twentieth century, and his research on trails, hiking, and outdoor recreation has appeared in Pennsylvania History and Landscape Architecture Magazine. Binnewies, Robert. Palisades: 100,000 Acres in 100 Years. New York: Fordham University Press, 2001. Chamberlin, Silas. “To Ensure Permanency: Expanding and Protecting Hiking Opportunities in Twentieth-Century Pennsylvania.” Pennsylvania History 77 (Spring 2010): 193-216. Mittlefehldt, Sarah. Tangled Roots: The Appalachian Trail and American Environmental Politics. Seattle: University of Washington Press, 2013. Scherer, Glenn D. Vistas and Vision: A History of the New York – New Jersey Trail Conference. New York: New York – New Jersey Trail Conference, 1995. Solnit, Rebecca. Wanderlust: A History of Walking. New York: Penguin, 2001. Waterman, Laura and Guy Waterman. 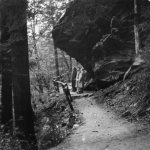 Forest and Crag: A History of Hiking, Trail Blazing, and Adventure in the Northeast Mountains. Boston: Appalachian Mountain Club, 1989. Papers of Orestes Unti. Batona Hiking Club Collection. Urban Archives, Samuel L. Paley Library, Temple University, 1210 Polett Walk, Philadelphia. Appalachian Trail Conference Papers. Appalachian Trail Conservancy Archives, 179 East Burr Boulevard, Kearneysville, W.Va.
Appalachian Trail, Lehigh Gap Trailhead, 8844 Paint Mill Road, Slatington, Pa.
Batona Trail, Ong Trailhead, 800 Magnolia Road, Vincetown, N.J.
Delaware & Lehigh Trail, Bristol Trailhead, Canal’s End Road, Bristol, Pa.
Laurel Hill Cemetery, 3822 Ridge Avenue, Philadelphia. Schuylkill River Trail / Fairmount Park: Kelly Drive, Philadelphia. Perkiomen Trail, Valley Forge to Green Lane, Pa. Informative and well-written. The pix and their labels are also excellent.